There's no avoiding the hard times. Every human being that's walked this Earth has had his or her share of the blues, from the personal to the political, the local to the global. But with another ominous headline coming every day, with news alerts constantly erupting from our various devices, with social media facilitating vitriolic shouting matches between friends and strangers alike, it's not too much of a stretch to say that our present era offers more than its fair share of challenges and burdens. Vincent Herring doesn't have the answers to those issues any more than the rest of us. What he can offer is a tonic to help calm the turbulence of modern life, at least for an hour. With Hard Times, his third release for Smoke Sessions Records, the master saxophonist supplies the perfect musical response to our troubled existence--part escape, part defiance; part lament, part laughter. Over the course of these 11 songs, Herring and his stellar band both sing the blues and shake them off in ways both healing and infectious. Hard Times arrives just in time to serve as a fiercely swinging distraction for the first anniversary of last year's dark election day. 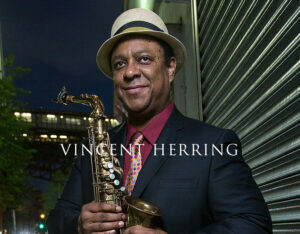 Herring has convened his own boisterous and soulful cabinet for the occasion, featuring a core quartet with pianist Cyrus Chestnut, bassist Yasushi Nakamura, and drummer Carl Allen. Herring's conception of the project evolved along with the tumultuous year as he was joined by Nakamura and Allen for two sets every Monday at Smoke for six months. The band is bolstered on roughly half the tracks by the horn section of trumpeter Brad Mason, saxophonist Sam Dillon, and trombone virtuoso (and Smoke Sessions label mate) Steve Turre. Guitar great Russell Malone casts his spell over three tracks, while the rich baritone of renowned vocalist Nicolas Bearde also graces three tunes. "The obvious red elephant in the room would be politics," Herring continued. "So it's hard times not necessarily just from my vantage point, but from looking at world events. At the same time, I do realize how blessed and fortunate I am to be living the life I'm living. I have a lot of real fans that support me and a lot of great people in my life; I have wonderful kids. This album will hit people in different ways, but I offer it as an uplifting piece for the hard times in the universe." Indeed, it's difficult to worry too much about the fate of the world when Nakamura and Allen lock into the deep-rooted groove of "Hard Work," the John Handy classic that opens the album. The song was a hit for Handy in 1976, just as Herring was learning to play the sax, so it provided a jolt of nostalgia along with its work song vibe. "I really wanted something simple like that," Herring says, "a song that meant something to me from my childhood." Released a few years later but no less influential, George Coleman's "Amsterdam After Dark" prompts intense solo turns from Herring and Turre, who spar vividly in its closing moments. Learning to embrace your troubles is the theme of Bill Withers' "Use Me," on which Bearde captures the allure of a relationship that may not appear exactly healthy from the outside. 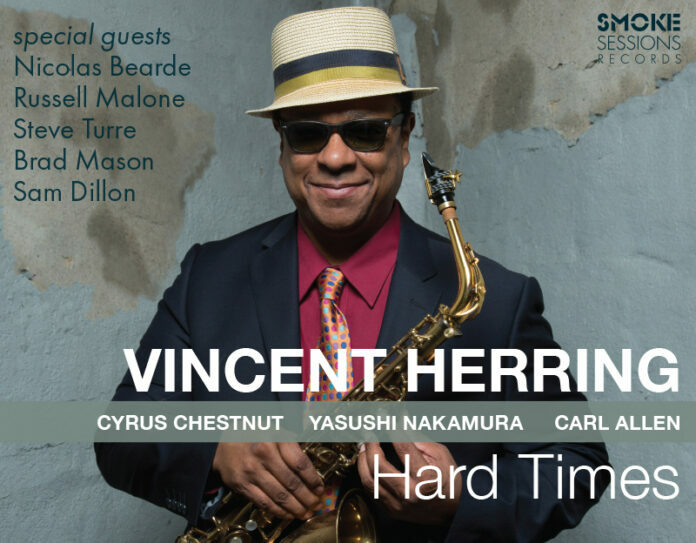 Bearde also illuminates the sultry atmosphere of "Summertime," the familiar standard transformed via an arrangement by Takahiro Izumikawa, who collaborated with Herring throughout the album. Izumikawa also gives another favorite, "Embraceable You," a contemporary twist. The album takes its title from David "Fathead" Newman's "Hard Times," which perfectly embodies Herring's theme of finding things to celebrate in the face of daunting obstacles. Herring shared the stage with Newman for the legendary Ray Charles sideman's final performance at Lincoln Center prior to his passing in 2009. Herring calls the late pianist Mulgrew Miller "everything from a friend to a mentor to my boss at William Paterson University," so the inclusion of "Eastern Joy Dance" is as much a moving tribute as it is a reprisal of a powerful composition. "Good Morning Heartache" also harkens back to one of Herring's mentors, the great Nat Adderley, while Donald Brown's "Phineas" closes the album on a soothing, lyrical note. In addition to these classics, two tunes originate within the ranks of the band. The leader himself penned "The Sun Will Rise Again," its instantly memorable melody evoking gorgeous playing from Malone. Herring and Allen originally recorded the drummer's lively "Piccadilly Square" together in 1989, with trumpet icon Freddie Hubbard sitting in. "We'd been recording before Freddie got there and patting ourselves on the back," Herring recalls. "I'll never forget, Freddie took his horn out just to warm up and scared us to death. He was so amazing. I've always wanted to revisit that song, so this was the perfect opportunity to do so." The selection of repertoire for Hard Times came down to a single principle: these are quite simply songs that Herring has loved over the years and have seen him through his own hard times--and he hopes his renditions will do the same for listeners. "All through my life, whenever I've had ups and downs, music has been the one thing that's always kept it positive for me," he says. "It's always been something that I could come back to and dig into to lift my spirits. This record is meant to be fun, it's meant to be uplifting, it's meant to be something that people will want to listen to over and over again." "Hard Times" was produced by Paul Stache and Damon Smith and recorded live in New York at Sear Sound's Studio C on a Sear-Avalon custom console at 96KHz/24bit and mixed to ½" analog tape using a Studer mastering deck.